Beer in the sun? Look no further: here’s our selection of some of London’s more interesting beer festivals taking place in July. As always, let us know in the comments if we’ve missed anything notable. The annual Ealing Beer Festival, usually one of London’s larger beery gatherings, looks even more substantial than ever this year, threatening something like 350 real ales from around the UK (including beers brewed in Ealing, for the first time), more than two dozen ciders and perries, and a hundred or so bottled beers from Europe. As is usual for CAMRA festivals, drinks prices will be ‘reasonable’ for the area, food offerings will be of the efficient ‘beer-absorbing’ variety, and the whole event will probably be run with a casual precision. The action takes place in Walpole Park, where entry to the festival will cost you a mere £4 (or £2 if you’re a CAMRA member), plus £3 for a tasting glass. 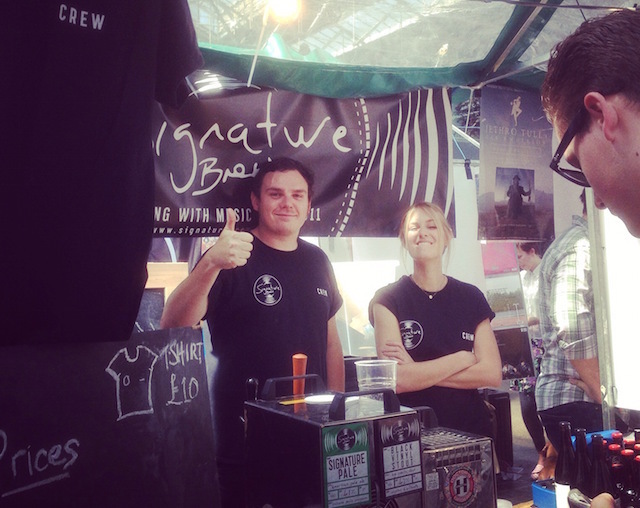 The summer instalment of London Brewers’ Market, a regular showcase of London’s vigourous brewing scene, returns to Old Spitalfields Market for a Saturday afternoon of beer and music. 25 London breweries (plus one mead maker from Penge) are set to feature, selling draught beer for consumption on the premises, and cans and bottles that can be taken away. Entry is free, just turn up from 11am. Worcester Park’s scout-hut-based beer festival returns for another year, offering more than 30 real ales (mostly from small Surrey-based brewers), as well as a generous handful of ciders and perries. Advance tickets for each of the three four-hour sessions cost £5 for entry only, or £10 including £6 worth of beer tokens. The location is a bit of a walk from the nearest station, so the organisers have laid on a courtesy coach service. Handy. If there’s anything that will tempt us to venture (slightly) outside the M25, it’s the geeky nirvana represented by the opportunity to combine beer and stream trains. The third Epping Ongar Railway Real Ale Festival promises just that - 30 beers, 15 ciders, heritage trains (and some London buses) that you can ride on, food and music - for three days from Friday 31 July. Our dusky-voiced podcast producer seemed to enjoy himself when he visited the festival last year, and so can you for £12 in advance (with further discounts for CAMRA members, children, families and concessions). To celebrate the United States’ Independence Day weekend with some hoppy American ales, you can pop along to the always-excellent White Horse on Parson’s Green, whose American Beer Festival kicks off tomorrow and runs until Sunday, or check out Shoreditch’s Strongroom Bar whose own festival will follow a similar theme on Saturday and Sunday. Entry to either event is free. If cider is your thing, the Ciderdog festival could be aligned to your interests. Taking place this Saturday (in Bethnal Green’s Sebright Arms) and Saturday 11 July (in Borough’s The Miller), the festival offers more than 100 ciders and perries, a decent selection of London-brewed beers, food from Bunsmiths, live DJs and some rather competitive drink prices (£3 a pint). Entry is free. Cricket-lovers can spend Saturday 11 July watching day four of the first Ashes Test on the TV screens at the Lord’s Tavern, while enjoying beer, barbecued food and live music in the pub’s beer festival. Tickets cost £8 in advance.